Taxonomy is a difficult concept. Correctly developing taxonomy in SharePoint 2010 takes that difficulty to the next level. You’ll be surprised to learn that taxonomy development is really not all that complex but very easy to get wrong. This post highlights considerations for planning taxonomy in SharePoint 2010. If you are a developer or an IT manager, it’s important that you understand taxonomy and its role in ECM. Why? Because it is very likely you have been or will be asked to implement ECM. Without knowing the what’s, why’s, and how’s, you will get nowhere. It’s shocking to me how many organizations demand that ECM be implemented by their SharePoint Developers, Architects, and IT Managers, without considering that ECM is not actually an IT concept. What: Taxonomy is a component of Enterprise Content Management ( ECM ). ECM is the methodology ( NOT TECHNOLOGY ) for capturing, storing, securing, and actualizing content. Taxonomy is the logical organization of content in an ECM system, such as SharePoint. This should not be confused with information architecture, which is the physical + logical storage of content. Taxonomy is an extremely strict, preset, static, and mandatory part of contributing any content to the system. There are different types of taxonomy, the most common being Regional, Functional, and Time Based. How: Using SharePoint, taxonomy is implemented using the Managed Meta-Data Service ( MMS ). Do not mistake MMS for taxonomy itself. Taxonomy is the practice; MMS is the technology used to execute that practice in SharePoint 2010. MMS is also used for the more flexible Folksonomy ( read an argument between Chris McNulty and myself here on the differences between Taxonomy and Folksonomy ). 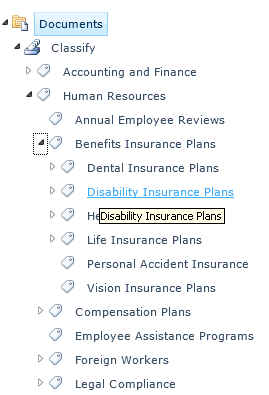 At minimum, companies will deploy taxonomies for functionality. Those are created per department or function. It takes 3 to 6 weeks to complete each taxonomy. Here are some rules to follow when building your taxonomy. Is the process fun? Unless you have OCD, definitely not. But, doing it right ensures taxonomy will not only be used, but used properly. I stated earlier that if your organization is not willing to commit to the process, don’t waste your time. Just be warned that retroactively implementing taxonomy is much worse than starting from scratch. To encourage adoption, many organizations will find super users who are champions within each department or even make a competition out of the process.